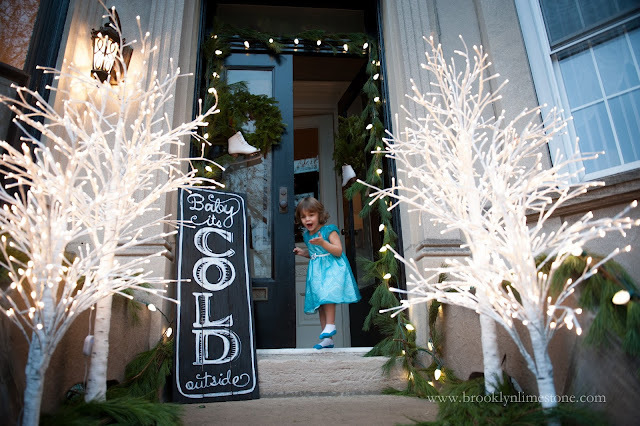 It's that time of year again, time to decorate the front door and steps of our house. 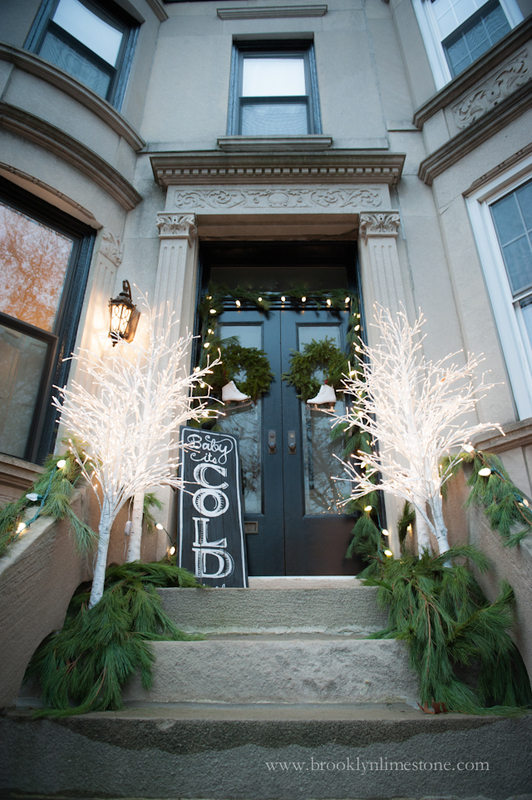 (Also known as a stoop around here) Of all the holiday decorating I do, this might be my favorite because it shines like a beacon as I'm making those last few minutes of my evening commute to my front door. There are a couple of new additions this year. First these LED Birch trees from Balsam Hill. These photos don't do them justice - they are super bright and beautiful. Once they are lit, I almost didn't need anything else and it looked so festive. 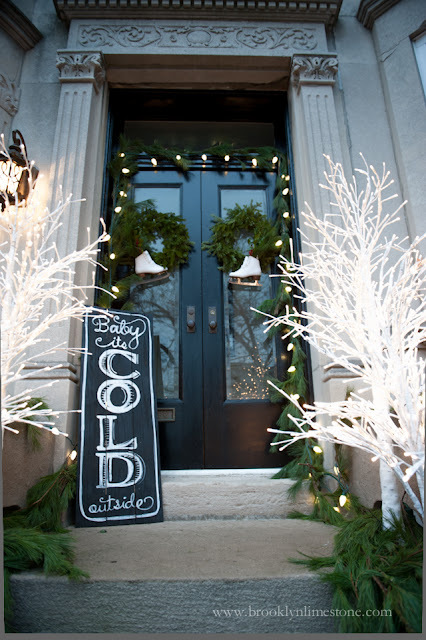 The best part is that I will feel absolutely no shame leaving these up well past Christmas - they are the perfect foil to winter's early evening darkness. The next much smaller but still exciting for me addition are the old ice skates I scored for $5 at a neighbor's junk sale earlier. I'm still searching high and low for discarded red wagons and flexible flyer sleds without much much but at least I got this one little element scratched off the list. They will be definitely be making a comeback. proof positive this is my kid! I love it! 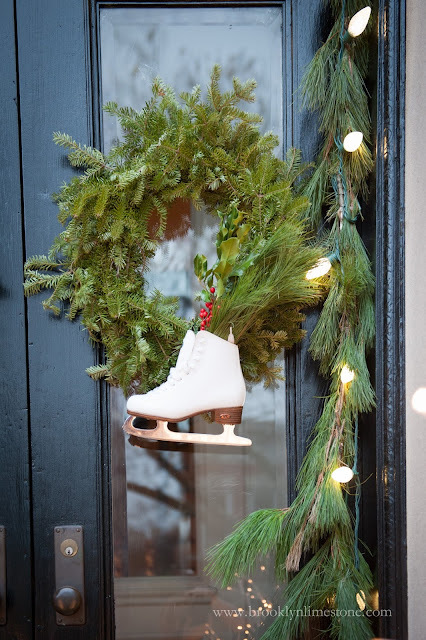 Great idea with the ice skates, and your daughter is absolutely adorable. Wow, just wow - so beautiful! So pretty! Thanks for the great idea!! Which size are those trees? TIA! Thanks! They are the 4 and 5 foot sizes. Looks so pretty and I love the trees! Such a doll! 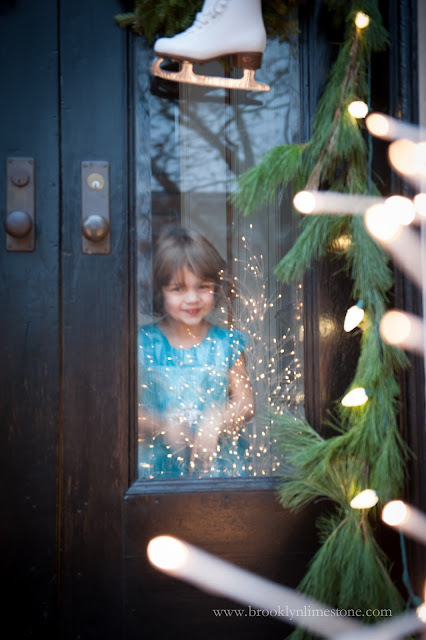 Enjoy Christmas through her eyes! Lovely home and a lovely heart you have under that beautiful roof! Her eyes sparkle and I can't believe how tall she's gotten. Such a doll! Absolutely perfect! Thanks for sharing. Absolutely gorgeous, and the stoop ain't bad, either! :o) Seriously, Aggie is so beautiful! 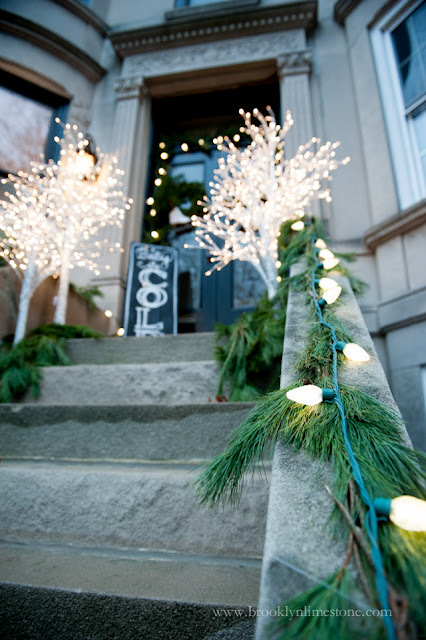 Your stoop is adorable, and I love that you'll be able to leave it up well beyond the holidays! Gorgeous! I have been on the hunt for ice skates, this year - and I've already scored the old sled and red wagon and in-law hand-me-downs. Although seriously, they are everywhere in the midwest. Also, did you make the garland? I'm just so smitten with fresh garland this year and want to try to make some. I love those big white Christmas lights! 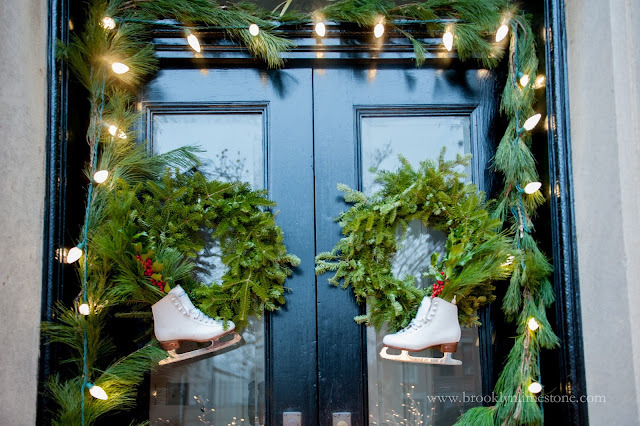 Those skates are so adorable! What a great idea.